Red, white and blue Christmas trees in the Grand Foyer carry out the patriotic theme. Projections of foliage run the length of the ceiling. First Lady Melanie Trump designed the White House Christmas display. 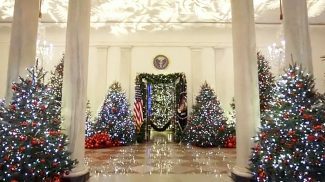 This year's White House Christmas decorations were unveiled in a video and announcement. "Designed by First Lady Melania Trump, the White House shines with the spirit of patriotism," the White House said in a statement. 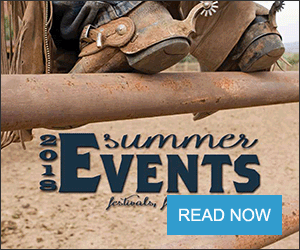 This year's theme is "America's Treasures." 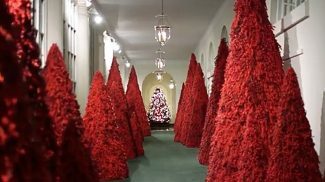 The display includes a row of Christmas trees made from red berries, which immediately led to controversy in the media. Inside the China Room are three tables, each a replica from previous state dinners using pieces from the White House permanent collection from different administrations: Theodore Roosevelt (1901-1909), John Kennedy (1961-1963), and Donald Trump. "As one makes their way through the Green Room, Americans are reminded of the country's bounty and harvest," the White House said. "A variety of fruits, vegetables, and grains adorn the tree centered in the room, as well as the garland on the mantel. 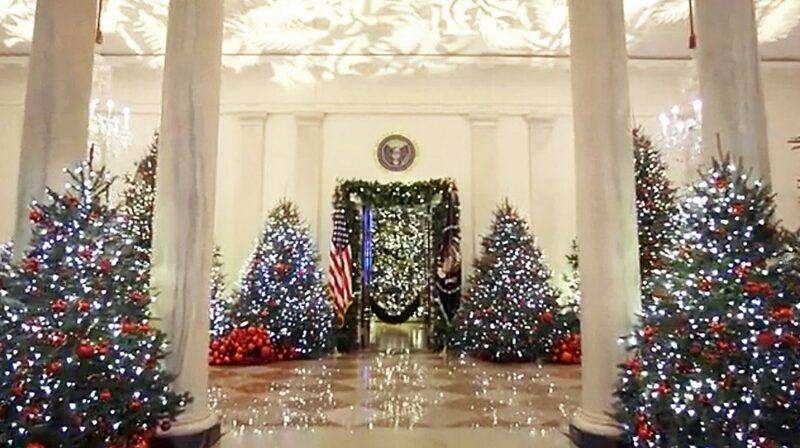 In the Blue Room, the official White House Christmas tree measures a soaring 18 feet tall and is dressed in over 500 feet of blue velvet ribbon embroidered in gold with each state and territory. "The State Dining Room is a celebration of our country's national symbols, including the bald eagle, the rose, and the oak tree. The space is also host to this year's gingerbread house, showcasing the full expanse of the National Mall: the Capitol, the Lincoln Memorial, the Jefferson Memorial, the Washington Monument and the White House. "Crossing into the Grand Foyer and Cross Hall, patriotism, the heart of America, takes center stage with more than 14,000 red ornaments hanging from 29 trees. The choice of red is an extension of the pales, or stripes, found in the presidential seal designed by our founding fathers. It's a symbol of valor and bravery," the White House statement said. "This is a joyous time of year when we decorate the White House for the Christmas Season," said First Lady Melania Trump. "Our theme honors the heart and spirit of the American people." 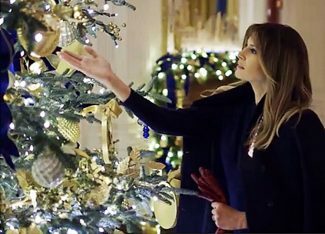 "Thank you to the many volunteers and staff who worked hard to decorate the halls of the People's House in Christmas cheer. On behalf of my family, we wish everyone a very Merry Christmas and a Happy New Year."